A Lebanese soldier opens fire into the air to disperse people who gathered around a man (on the ground) whom they claimed was a suspected attacker in Burj al-Barajneh, southern Beirut, Lebanon, Thursday, Nov. 12, 2015. Lebanon is observing a national day of mourning Friday for the 43 people killed in twin suicide bombings in a Beirut suburb. The Health Ministry says 239 people were wounded in the blasts Thursday. 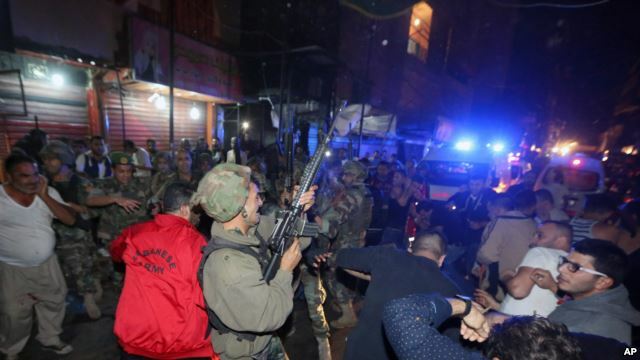 Islamic State militants claimed responsibility for the explosions targeting Burj al-Barajneh, a busy commercial and residential neighborhood controlled by Hezbollah, whose fighters back Syrian President Bashar al-Assad. Police say there were two explosions minutes apart. The body of a third attacker whose suicide belt did not detonate was found in the rubble. Survivors say there were blood and bodies everywhere. One man said he thought the world was coming to an end. U.N. Secretary-General Ban Ki-moon warned Lebanon not to allow "this despicable act to destroy the relative calm that has prevailed in the country over the past year." 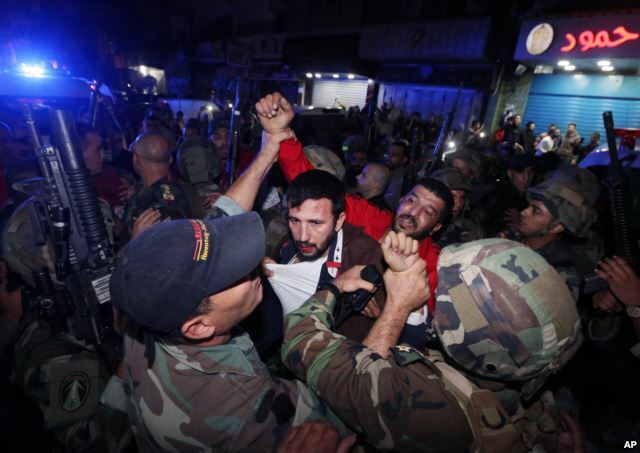 Lebanese soldiers arrest a suspected attacker near the scene of a twin suicide attack in Burj al-Barajneh, a predominantly Shi'ite suburb of southern Beirut, Lebanon, Nov. 12, 2015. An official with the mainly Shi'ite Hezbollah says Thursday's terrorist attack will hardly deter the group from going after the mostly Sunni Islamic State. "This is not a small battle and it is a long war between us," Hussein al-Khalil said. "We still do not have enough information about who is behind this, but it is expected that Islamic State and all who belong to these monsters can adopt such operations that are against humanity and against society." 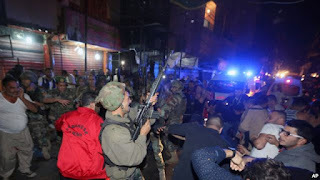 The Burj al-Barajneh section of Beirut has been hit by terrorism in the past and Sunni militant groups have threatened to carry out more attacks. The White House condemned "in the strongest terms" the "horrific" attack and sent its condolences to the families of the victims. Spokesman Ned Price said, "Such acts of terror only reinforce our commitment to support the institutions of the Lebanese state, including the security services, to ensure a stable, sovereign and secure Lebanon."